So about a week ago I got it into my head that I wanted to make chiles rellenos (stuffed poblanos). And then what seemed like the next day I came down with bronchitis – we’ve had a ton of smoke from forest fires, and my lungs just couldn’t take it anymore. Which basically meant I was too tired to cook or be inspired to try something new all this past week. I had a couple cobs of corn and the poblanos waiting, some chicken in the freezer, and a small bit of rice left in a bag. 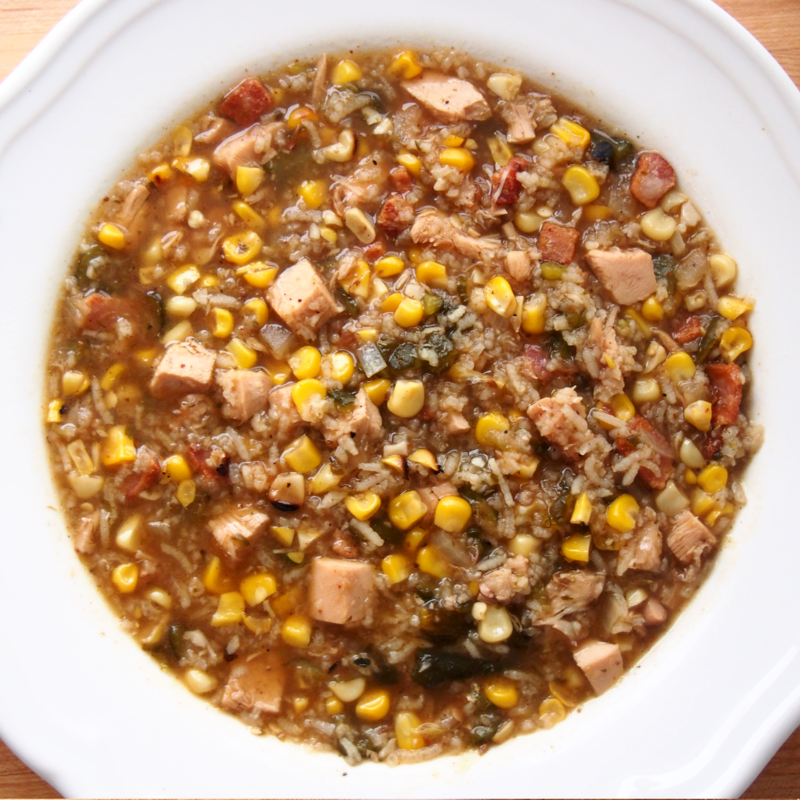 As it’s a lazy Sunday kind of day, I thought I would use up what I had and made up a batch of roasted poblano chicken soup, with roasted corn, rice, and bacon thrown in. It came together quickly, has just the right amount of heat, and was damn tasty. It was a tad salty, but nothing off-putting, due to the fact that I didn’t factor in the saltiness of the bacon. It was a perfect day to have soup, too, as we are both recovering from colds and it’s overcast and drizzling. Heat up a bbq so one side is quite hot and the other side medium. Roast the poblanos on the hot side and corn on other for about 15 minutes. Turning the peppers and the corn every 5 minutes or so. The poblanos should be charred on the outside and the corn just starting to be cooked through. Place the poblanos in a bowl, covered with saran wrap. Set the corn aside for the moment. In a large soup pot, render the fat out of the bacon. Once the bacon pieces have crisped, remove with a slotted spoon. Add the cumin seeds and onion, and saute on medium heat until the onions are translucent. In the meantime, remove the skin and seeds from the poblanos, and chop small, and cut the kernels from the corn cobs. Add the garlic and continue to saute for another minute or so. Add the rice and toss to mix and let saute for another minute. Add the liquid, bacon, chicken, spices, corn and poblanos, and bring to a simmer. Let simmer for about 30 minutes, then taste for any needed salt and pepper.